This 1900s farmhouse in the Santa Cruz mountains had so much potential, but was suffering from multiple remodels that seemed like a mishmash of styles. Paring back the color and material palette let the home's original beauty and detail shine through, while modernizing the space. The buttercup yellow and stained door gave the farmhouse a dated feel. While cheerful, the color competed with the surrounding beauty. The fresh white paint gives the stately home an elegant and timeless feel, emphasizing the surrounding mountains. The black door and shutters give just enough of a modern edge to update the feeling of this classic farmhouse. Dark and heavy green stained paneling added visual weight to the living room, the natural light and high ceilings completely lost in the combination of dark beams and dark trim. The light floor pulled focus furthering the illusion of shortened space. White washing the walls, beams, and paneling opened up the living room, letting the inherent elegance of the sitting area come through. The bold black floors and staircase banister anchor the space with a point of contrast. Playful lantern lighting sprinkled across the ceiling is an unexpected touch that modernizes the sitting room. Natural textures and warm neutrals lend comfort and ease to the space, with hints of greenery bringing the outside in. The bathroom layout left a lot to be desired, with a funky shuttered opening looking onto the bedroom, and a lot of space being taken up by a hallway and small closet at the main entrance to the bathroom.The layout of the bathroom got an overhaul, with the hallway and closet removed to make the bathroom footprint larger. The bathtub bump out was closed off to create a much more functional and accessible closet. Inside the bathroom, a beautiful patterned tile runs along the floor and up a wall, creating the perfect spot for a soaking tub. A rustic vanity with soapstone counters and concrete vessel sinks is the perfect moody addition to the bathroom, with brass accents in the vintage inspired lighting and faucets adding warmth. The new layout even allowed space for a walk in shower, with beveled subway tile adding a classic element. A nightstand is probably one of the last elements of our bedroom we think about when picking furniture and décor, but this functional addition lends a lot of style and make a bedroom feel complete. From mid-century to sleek and modern, there are nightstands at every price point that can contribute to your bedroom’s design. Below are some of our favorites. 6. We love a good lunch salad, and right now is a great time to be taking advantage of spring produce. It’s easy to get sick of the same old salad routine. These three warm salads are a great way to whip up a quick, satisfying dinner or lunch. Via MyDomaine. 7. It comes as no surprise that we love a good wallpaper, so that’s why this renter-friendly list of wall decals (that seriously mimic the look of luxe wallpaper) is so appealing. Perfect for switching up your summer style easily. Via Apartment Therapy. Velvet is a timeless fabric, but people often picture their grandmother’s sofa collecting dust in an attic when they think of the material. Not anymore, velvet has made a huge resurgence with so many lovely applications from tufted headboards and sofas to chairs and restaurant banquettes. Velvet adds a layer of vintage, luxurious charm and can also feel modern and exciting with linear upholstery techniques. Rugs can bring together an entire room, by anchoring a color palette or layering in texture with natural fibers. A rug can be the focal point or fade into the background to let other pieces shine. From modern to traditional, muted tones to overdyed, we love rugs in every category. Check out our picks below, and then follow us on Pinterest for more of our favorites. The office can often become the part of our home with the most clutter, a dumping ground for our unwanted items. One way to get this space into shape is by adding strategic shelving and storage where your books, papers, and electronic gadgets can live. Doing this will free up your desk space, creating the ideal clean work surface for all your projects. Take your cues from this office found on Pinterest designed by ABD Studio, the beautiful built-ins provide plenty of storage, while the trestle desk and soft furnishings create a sophisticated space. 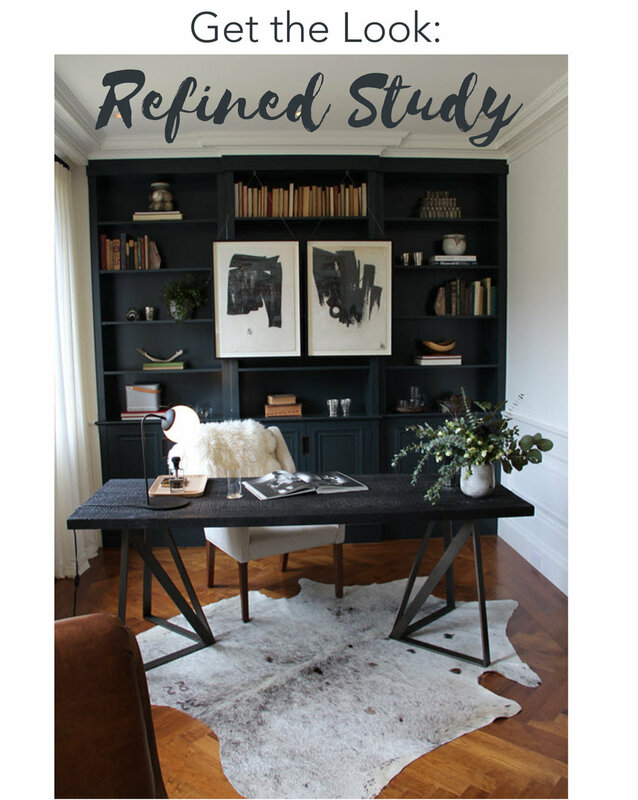 For more on how you can get this look for your own home office, click on the image and links below.